The translators of the English version, Jörg W. Rademacher („Gelehrtes Münster und rundum“), formerly of Münster, and David Pierce (Reading Joyce) from Münster´s twin city York, have brilliantly mastered both to do justice to the authors’ love for Münster and catch their humorous and witty style. 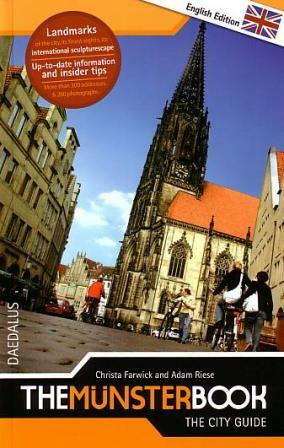 Now also visitors to Münster from abroad can enjoy this informative as well as entertaining portrait of the city. It’s due to their expert inside knowledge and their treasure trove of experience that both authors could draw on almost unlimited recources: “We had been collecting a great deal of stories for years. This is why we could create this blend of the typical and the unusual that entertains tourists and amazes even old-time Münsteraners.” Farwick and Riese indeed cover a lot of ground ranging from the gruesome history of the Anabaptists’ rule of terror to the pulsating life at Münster’s places of interest of today. The tours of “Altstadt”, of “Kreuz-“ and “Hafenviertel” are packed with notes of neighbourhood specialties. Additionally, there are amusing stories about local celebrities of past and present such as the “mad” Bomberg, an eccentric baron of local fame, Professor Landois, the founder of Münster’s zoological gardens, Udo Lindenberg, a rock star, or Ute Lemper, a well-known singer and dancer. In further chapters, Farwick and Riese venture into Münster’s art scene and night life, introduce the reader to original local characters such as Pinkus Müller, and look out for vestiges of women’s contributions to the city’s history. It’s also both informative and exciting to read up on the beginnings of Münster as the European capital of sculptures. Thanks to their contacts to the theatre, music, and film scene, the authors were able to win VIPs for very personal tips: TV-star Götz Alsmann lets us know how he attained a sailing license on the “Aasee”; Mechthild Groβmann, starring as the prosecutor in the TV-series “Münster-Tatort”, shares the memories of her childhood in the “Kreuzviertel”. Like its German equivalent, the Münsterbook satisfies through its combination of current information and an appealing design, an easy-to-read street map and numerous detailed charts. Besides offering historical facts and a close-up view of the city’s cultural treasures, the book provides quality tips for leisure activities, for dining and shopping. 333 web links round off the book’s “service” section with its over 300 addresses. The authors are themselves deeply rooted in Münster’s cultural scene. The journalist and public-relations specialist Christa Farwick has shaped the city’s cultural scene since the 1980s. For just as long a period of time Adam Riese has been known in Münster as a music expert, freelance author and presenter.